If you're looking for a big-screen phone that's long-lasting and powerful, but which won't destroy your bank account, the Honor 8 Pro is well worth considering. Just don't say we didn't warn you about the width. Where’s the gloss back gone? Big phones are a big deal. And the Honor 8 Pro is the company's largest phone to date, with a whopping 5.7-inch screen wrapped into similar-to-iPhone-7-Plus proportions. If you want screen real estate and resolution then this is the Honor for you. However, the Pro is a rather different proposition to the mid-level, smaller-scale Honor 8. The Pro is obviously larger, but it also does away with the hallmark ultra-gloss rear in favour of a softer blue matte option (black and gold are also available). It still looks great, but lacks that core point of distinction of the original. Unlike the smaller handset the Pro also offers flagship power - with a specification roughly matching its Huawei P10 Plus flagship cousin. But the real carrot dangle is the price. 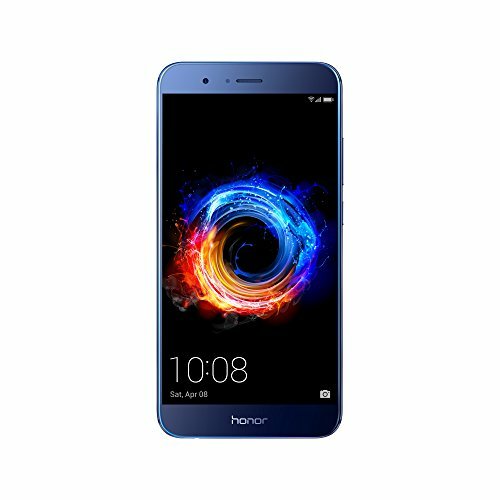 At £475 the Honor 8 Pro undercuts the current flagship competition - Samsung Galaxy S8, LG G6, iPhone 7 Plus (ok, that last one is from 2016) - by over £200 a piece, while remaining within touching distance of the OnePlus 3T. There are some marginal compromises, as we've found from our 72-hours of use, but nothing that doesn't befit the asking price or undermine that "Pro" name. With the Honor 8 Pro was placed into hand the first thing we could feel is just how wide it is. For us it's a smidgen too wide - but then we'd say exactly the same thing about the iPhone 7 Plus and, having put these two phones literally face-to-face, they are practically identical in size. How you feel about that width will be entirely down to preference, but in the world of taller phones with more cinematic screen ratios - the Galaxy S8 and has a larger diagonal screen measure, for example, but is far less wide a device - this Honor feels less future-thinking in that regard. What it does have on its side is a slender build. At just under 7mm, it's actually thinner than the iPhone 7 Plus, yet crams a much more capacious battery (at 4,000mAh) under its metal skin. The joins between said metal and the screen edge don't show-off chamfered edging, like in the Huawei P10, a feature that's reserved only for the Pro's diamond cut edging of the rear-positioned fingerprint scanner. This scanner's circular form cuts into the back elegantly, although we feel it's placed a little too high up the design for always natural use. The 8 Pro doesn't hide the antenna lines from sight like in the P10 either - instead they intersect through the top and bottom of the rear, although the top one has been thoughtfully integrated into the design by cutting through the centre of the dual camera module and centre-aligned flash. It looks pretty good. Above all else, though, the standout feature of the Honor 8 Pro is its blue colour (well, if you pick the navy blue finish). It has a soft sheen to its appearance and, unlike the smaller Honor 8 with its high-gloss rear, doesn't attract fingerprints too heavily. We prefer it over the textured Huawei P10 backs, too, especially as these can get marked easily. In the same breath we're perplexed at the decision to entirely remove the high-gloss as an option from the Pro, given how defining it is in the original Honor 8. That's a decision made all the more apparent given how glossy the Pro's front screen and its surrounding bezels are - something that can be distracting with overhead lighting. In addition to USB-C charging, there's a bottom-positioned 3.5mm headphone jack, while a dual SIM tray - slot two doubles-up as a microSD slot for storage expansion beyond the 64GB standard - lives to the side edge. The colour's grabbed your attention, but so will the Honor 8's screen. This is the largest panel in the company's handsets, at 5.7-inches diagonally, but also shows off a super-high quad HD resolution. That's a first for Honor. And it really shows in use. Yes, the screen is a bit too wide and its colour balance by default isn't as popping as some - it's not as warm or as bright as the Huawei P10 Plus which we've looked at side-by-side, but the difference is so slight that you won't notice in isolation - but it's got all the brightness, acute viewing angle ability and crisp resolution you could want. The screen can get a bit smeary during use, but it doesn't present rainbow-coloured streaks when there's too much fingertip secretion - unlike the Huawei P10 which has an issue with this once the screen protector is removed. The Pro has no factory-fitted screen protector, but it is coated in Gorilla Glass 3. Why hello there flagship innards. Whereas Honor handsets typically aim at the mid-level, the Pro - as its name might suggest - is cutting in higher up the ranks. Its Kirin 960 chipset is every bit as proficient as you'll find in the P10 Plus, including 6GB RAM to go along with it (the only difference is 64GB on-board storage rather than 128GB of the Plus). The experience we've found to be every bit that of the P10 Plus, too. Now, in that higher-positioned model we had some criticism of apps not seeming to always run at full proficiency. At the price of the Honor 8 Pro, however, this doesn't feel like an issue to the same degree. Because, overall, the experience is top notch: whether a Candy Crush addict or more into Real Racing, none of that will be a problem here. There's an added gaming quirk, too: the 8 Pro's box doubles-up as a cardboard VR viewer. And with Jaunt VR installed from the off, if you want to dabble in the entry-level of VR then this phone has all the power and resolution that you'll need. A great fun idea. Software-wise, the Pro also runs EMUI 5.1, the latest iteration of Huawei's operating re-skin (which sits over Android 7.0). The software experience isn't always the best-looking - some of the Themes really aren't pretty - but it can be tweaked to suit. What the software does bring, however, are some great features like WhatsApp and Facebook apps per SIM (App Twin), which isn't possible on many other phones; there are also knuckle-based commands (for when fingertips just aren't enough! ), and machine learning for an optimum long-term user experience. That's one thing Huawei (and, in this instance Honor) is really hot on: longevity. We've only had this phone for three days, so can't comment on how it'll feel three months down the line, but on each of those days we've been getting from a full battery down to around 35 per cent after 16-hours of considerable use with a mixture of day-to-day tasks and casual gaming. Go lighter and we'd expect approaching two days from the Pro, especially if limiting the CPU with the battery optimiser mode. There's also QuickCharge for speedy top-ups when you do need to reach for the plug. Part of this longevity per charge is down to the considerable 4,000mAh battery on board (the benefit of a large device size), but it's also to do with the software. EMUI 5.1 is fairly heavy in its alerts and prompts, by default it closes apps, too, such as Slack not pushing messages without opening the app itself, for example. This all aids lower consumption, but it does affect the user experience too. Some intervention deep in the menu system can force apps to remain open and you can cease prompts to close apps (per app) too, to make for a more streamlined, personal user experience. Ultimately the Honor 8 Pro has battery life on its side. And not because its scrimping on the spec front. This is one powerful, long-lasting and affordable phone that's every bit as good as - if not better - than the Huawei P10 Plus, all things considered. If you've been following Huawei's camera journey of late then you'll have noticed the Leica-approved lenses and software in its phones. Honor skips this top-end part of the camera package, however, but it has a similar overall experience, with dual lenses - one colour, one monochrome sensor, both of which are 12-megapixel - able to capture and depth-map images for pseudo bokeh effect (that melty soft background effect). The lenses are each 28mm equivalents with f/2.2 apertures, meaning plenty of light can get in to capture a shot. The Wide Aperture mode can be set from f/0.95 through to f/16 if you want software-applied adjustments - which vary in their success, just as we've said of the Huawei P10 and P10 Plus, along with other manufacturers operating this kind of software solution. In the right situations, however, the melty background effect can look decent, so long as you're not viewing the image outside of the phone where edge-softening imperfections can often be seen. Still, it's a fun effect that people will enjoy and can even be applied in real-time to video capture (up to 4K). In addition to standard capture, a swipe from left to right of screen will open the menu, where Pro Photo - for full manual control - and Monochrome modes exist, alongside a handful of other options. It's easy to access and you can switch off the current mode from the main screen whenever you want, reverting back to standard shooting. For us it's the standard shooting that's best of all. It's not got the world's fastest autofocus. It's not got best-in-class sensors or resolution. And by default the colours are oversaturated. But for a sub-£475 device the cameras are decent in a variety of conditions, they focus just fine - even up-close - and offer all the modes that you're likely to need. Take a lot at the shot of a paint pot, below, complete with lots of detail in the surface. And because EMUI 5.1 is running in the background, the device also brings the benefit of Highlights. With GPS activated, location tagging is possible and the 8 Pro will arrange your shots into named galleries in the Discover section of the app. These even come with (GoPro Quik) video reels, which you can save, delete or edit to your heart's content - or tell the phone to stop creating them, if you don't want them. However, we feel the Pro is too wide in the new world of taller phones (look at the LG G6 or Samsung Galaxy S8), its fingerprint scanner is positioned too high, and it's a shame the defining ultra-gloss finish isn't available as an option (that said the navy blue does look great). The software can be a bit heavy handed on the prompts and isn't the prettiest either, but it's the most mature EMUI outing to date. And in the order of things those are all minor qualms. The so-called "flagship killer" has always had price on its side. It might not have as capacious a battery or as high a screen resolution as the Honor 8 Pro, but that sub-£400 price point is what makes it really appeal. And it's not quite as wide which, for us, makes it the preferable device. If you're feeling a little more flush and don't want a phone quite as wide then, well, Honor's cousin Huawei has a great offering in the P10 Plus. It's a little slimmer, but just as powerful and has better dual cameras too. Whether you're interested in iOS or Android will depend on whether the iPhone 7 Plus is a device for you or not. The reason its in this comparison is simple: it's so similar is size and stature to the Honor 8 Pro that it's impossible not to compare them. Honor has been clever here by delivering almost as much flagship for a lot less money in an Android package.